SHE’S STRONG. SHE’S SMART. AND SHE’S WAY IN OVER HER HEAD. Deena Sharpe knows nothing about investigating a cold-blooded murder, but when her sweet aunt asks her to find out who killed her son, that’s exactly what Deena agrees to do. Only hitch, he died fifty years earlier, although his body was just discovered in a sheriff’s forgotten evidence closet. To make matters worse, a big-city conspiracy nut is determined to cash in on her family’s misfortune and implicate Deena’s dead cousin in the crime of the century. Can this small-town, southern woman with genteel manners out-wit those who’d rather keep the truth under wraps, or will her family make front page news for all the wrong reasons? 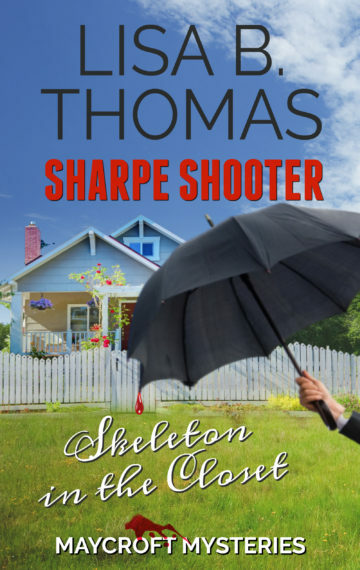 Sharpe Shooter: Skeleton in the Closet is the first standalone whodunit in the clean and humorous Maycroft Mysteries. If you like perplexing puzzles, quirky characters, and a mature, savvy sleuth, you’ll love Lisa B. Thomas’ mysteries with heart and humor. Buy Sharpe Shooter today to unmask a killer and get a good chuckle along the way.